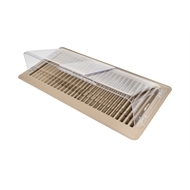 This air.deflector is ideal for 15 x 35cm and 10 x 40cm vents. It has 2 pieces and adjusts to the length of your floor vent. It has magnets to attach to wooden vents. We recommend double sided tape for plastic or wooden vents.